Brands looking to generate social media ROI are moving inexorably toward one of two poles: either the social CRM approach whereby the customer service benefits of social media are emphasized; or the social media marketing approach, where the focus is squarely on selling stuff. If your focus is on selling via social media, it’s imperative that you know what your competitors are doing in the arena, as it has a direct impact on the attractiveness and success of your offer. This is true of all forms of marketing, and I spent my share of mind-numbing hours as a young marketer creating files of competitors’ print ads and the like. I once spent a sweaty afternoon in Phoenix, driving around town in my crappy car without air conditioning, taking photos (on film) of competitor billboards. I drank 88 ounces of Diet Coke that day. Good times. Jittery times. However, the volume and fluidity of social media makes it exceedingly difficult to task your intern to keep tabs on your competitors on Twitter. You Think YOU Have an Inbox Problem? To the rescue comes Email Data Source. Since 2003, Email Data Source has been collecting email promotions from thousands of retailers. They have more than 17 million emails on file, sortable by brand, date, offer, creative and more. They receive and sort 40,000 emails every day. It’s a useful service, as email marketing drives millions of dollars in online purchases daily. Knowing what competitors are doing, and what they’ve done in the past, is invaluable. And now, you can do the same thing on Twitter. 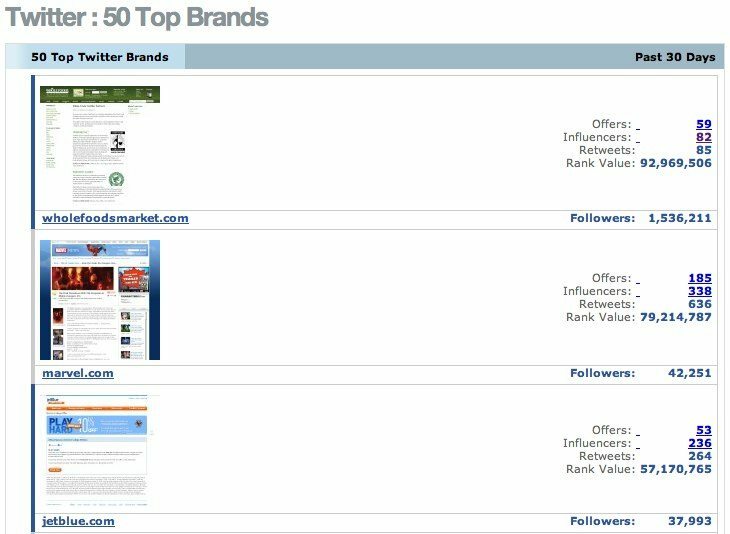 In the past 30 days, the most effective brands on Twitter (determined by number of followers + number of followers of people who retweeted) were Whole Foods, Marvel Comics, and Jet Blue. It’s important to note that Email Data Source only tracks tweets that include an offer and a link. Email Data Source helps identify Twitter “influencers” by tracking the number of times a person retweets offers from brands, and what they are likely to retweet. For example, Estonia-based Twitter user Joao Lopes Marques rarely tweets in English. But when he does, it’s often a retweet of a brand promotion, usually in the travel category. In the past 30 days, he’s retweeted 14 tweets captured by Email Data Source. You could easily use this information to tailor a pitch to him, or include him in a blogger outreach initiative. The Email Data Source blog has some other interesting case studies and findings. 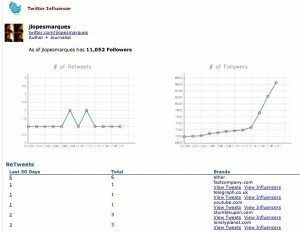 The one issue I have with Email Data Source in current form is its partial reliance on number of followers to calculate influence, and therefore tweet and brand success. I’m okay with counting the number of retweets and making that a success metric. But with the proliferation of follow-back schemes, I’m not certain that follower count is the most reliable gauge of Twitter influence, and several apps such as Twitter Grader and Tweet Level and Klout are taking a more detailed approach to determining Twitter influence. Perhaps Email Data Source could incorporate one of these metrics, via API? 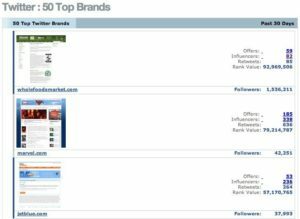 For now, Email Data Source is an ideal tool for monitoring what other brands are doing on Twitter, and how successful they are from the standpoint of reach – how many people were theoretically exposed to the offer. Currently, Email Data Source is packaging access to their email database and Twitter database together. Pricing starts around $1000/month, and the competitive data you’ll glean is a bargain for mid-sized and larger brands, and their agencies.